The key to success in raising funding is identifying the areas within the company where funding options could apply, and then providing a comprehensive solution specifically designed to meet those needs. 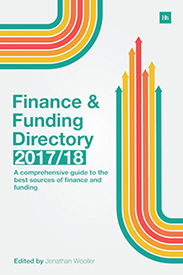 Now in its fourth year, The Finance and Funding Directory is the essential guide to the financial resources available in the UK today. "Following last year's very successful edition which saw us sign up with Harriman House - the leading independent UK publisher of business, trading, investing and economics books - we saw, for the first time, our Directory sold and distributed through the likes of Amazon, Kindle, iBooks, and many other well-known outlets, both online and in printed format. As a result, the FFD has been sold and downloaded to an audience of over 10,000 and we are truly delighted with the results. We have decided this year however to greatly extend the distribution of the Directory by offering a completely free download of the FFD in its entirety - predominantly for the use of the professional community. Our target this year is to distribute in excess of 50,000 copies, which in turn will make us the leading directory and definitive source of information in the Finance and Funding market sector."